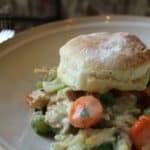 This Chicken & Biscuits Potpie Combines the warm flavors of Potpie with the buttery, flakey layers of Biscuits into one grand masterpiece. Last week I had one of those days where I wanted my Dad’s homemade chicken noodle soup. Then give me a blanket, a good movie and something hot in my hand and this would have rounded out the day to be perfect….but…that isn’t going to happen. So with this in mind, as I went to make dinner I decided pot pies were the way to go. With this meal, I would get that “home cooked” meal feeling I was needing. And to change things up a bit and because I love bread, I decided to make an inside out chicken pot pie and let me tell you….mmm…mmm…mmm! To make the biscuits: In a large bowl, stir the flours, baking powder, baking soda, salt, and sugar together. With a pastry cutter or your fingers, cut the butter into the dry ingredients until the butter resembles crumbles. Stir in 3/4 cup of the buttermilk with a fork until the mixture forms a soft, slightly sticky ball. If the dough is too dry, add a little extra buttermilk – 1 tablespoon at a time up to 2 tablespoons. Transfer the dough to a well-floured work surface and pull it together into a ball with your floured hands. Pat the dough out to 3/4″ thickness and cut out 12 rounds with a 3-inch biscuit or cookie cutter. Transfer the biscuits to a parchment-lined baking sheet and chill until you’re ready to use them. The biscuits can be made and kept covered in the refrigerator for up to 2 days in advance. To make the filling: Preheat the oven to 400° F. Heat a large heavy-bottomed pot or Dutch oven over medium-high heat and add the oil. Once the oil is hot, sauté the onions, carrots, and celery until tender, about 5-7 minutes. Season with salt and pepper to taste. Transfer cooked vegetables to a bowl with the chicken; set aside. Reduce the heat to medium and add the butter to the same pot. When melted, stir in the flour and cook, stirring constantly for 1 minute. Whisk in the milk, chicken broth, and thyme. Allow the sauce to come to a simmer and let it simmer for 1 minute to thicken. Season with salt and pepper and stir in the sherry (if using). Turn off the heat and transfer the vegetables and chicken to the pot, stirring until the filling is well-combined. Mix in the peas and parsley. If the filling is too thick (you’ll know), stir in the extra chicken broth, about 1/4 cup at a time up to 3/4 cup until the filling loosens up a little. Pour the filling into a 13×9-inch baking dish and bake for 18 minutes. Remove the dish from the oven (keeping the oven on and the door closed) and top the filling with the biscuits. Return the baking dish to the oven and bake for an additional 10-12 minutes, until the biscuits are golden brown and the filling is bubbly. Cool for 5 minutes before serving. Do you love the original flavors of Chicken Potpie? Check out this recipe! Doesn’t the taste of Homemade biscuits warm your heart? if it does, check out these recipes! In a large bowl, stir the flours, baking powder, baking soda, salt, and sugar together. With a pastry cutter or your fingers, cut the butter into the dry ingredients until the butter resembles crumbles. Stir in 3/4 cup of the buttermilk with a fork until the mixture forms a soft, slightly sticky ball. If the dough is too dry, add a little extra buttermilk - 1 tablespoon at a time up to 2 tablespoons. Transfer the dough to a well-floured work surface and pull it together into a ball with your floured hands. Pat the dough out to 3/4" thickness and cut out 12 rounds with a 3-inch biscuit or cookie cutter. Transfer the biscuits to a parchment-lined baking sheet and chill until you're ready to use them. The biscuits can be made and kept covered in the refrigerator for up to 2 days in advance. Preheat the oven to 400° F. Heat a large heavy-bottomed pot or Dutch oven over medium-high heat and add the oil. Once the oil is hot, sauté the onions, carrots, and celery until tender, about 5-7 minutes. Season with salt and pepper to taste. Transfer cooked vegetables to a bowl with the chicken; set aside. Reduce the heat to medium and add the butter to the same pot. When melted, stir in the flour and cook, stirring constantly for 1 minute. Whisk in the milk, chicken broth, and thyme. Allow the sauce to come to a simmer and let it simmer for 1 minute to thicken. Season with salt and pepper and stir in the sherry (if using). Turn off the heat and transfer the vegetables and chicken to the pot, stirring until the filling is well-combined. Mix in the peas and parsley. If the filling is too thick (you'll know), stir in the extra chicken broth, about 1/4 cup at a time up to 3/4 cup until the filling loosens up a little. Pour the filling into a 13x9-inch baking dish and bake for 18 minutes. Remove the dish from the oven (keeping the oven on and the door closed) and top the filling with the biscuits. Return the baking dish to the oven and bake for an additional 10-12 minutes, until the biscuits are golden brown and the filling is bubbly. Cool for 5 minutes before serving. My review: Love this recipe!!!! It fit my mood perfectly and was exactly what I needed. Kids review: Well there was no crying or pouting so I would say that is a success. 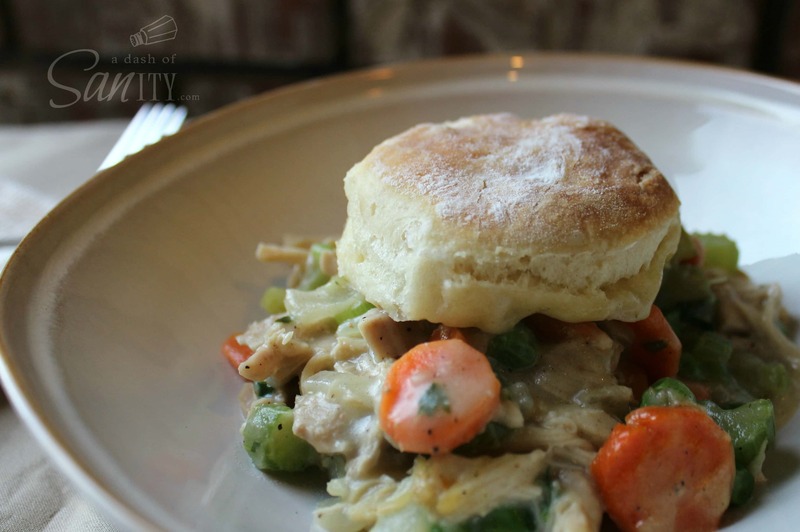 A side note, my husband hates chicken pot pies and even chicken noodle soup, he liked this recipe and LOVED the biscuits! We will make again and again, maybe adding some mushrooms instead of peas next time. This sounds delicious and I love that you made your biscuits from scratch. Pinning this to my I want to eat for dinner board. Made this last night…delicious!!! And I honestly hate when people are all, “I made this but changed like 10,000 things” but I added diced red potatoes bc I love potatoes in pot pies. And tried your suggestion of mushrooms instead of peas. TOTAL WIN. And I cooked it all in a Dutch oven that went straight from stove top to oven (bc I’m lazy like that). Thanks for sharing this! It’ll def be part of our winter menu rotation.